An essential part of any HVAC technician’s work is the ability to identify and fix refrigerant leaks of all kinds. This can often be trickier than expected. Methods of diagnosis range from the classic “soap and water” visual inspections to expensive pieces of equipment. Finding the balance between cost and precision with your tools can be difficult. This is where LotFancy Leak Detector has your back. This leak detector offers a range of leak-detecting modes in a low-cost package. The LotFancy Refrigerant Leak Detector is a strong all-around tool for Freon detection. It works by testing the air for chemical particles through its flexible sensor. It is suitable for use on automobile AC systems, refrigeration units, AC units, and more. It detects a wide range of halogenated refrigerant chemicals (HFCs, CFCs, and HCFCs), cleaning agents, and other gases which contain bromine, fluorine, and/or chlorine. This device offers adjustable sensitivity for detecting leaks. It can be calibrated to work in saturated environments or detect minute levels of Freon in fresh air. The unit has a flexible stainless-steel probe for testing in hard-to-access spots. It can test behind refrigerators, inside vents, or within otherwise inaccessible systems. There are two indicators on the device. One is the “leak alarm.” It emits a loud sound when it encounters any level of refrigerant. The other major indicator keeps tabs on the battery level. LotFancy Leak Detector’s active processing helps pinpoint leakage points. The device produces louder and faster tones as Freon concentrations increase. The major selling point for LotFancy Leak Detector’s “Automatic Circuit” is real-time detection. The active adjustment process means quick identification of leaks in any environment. There are also manual detection settings to calibrate the tool. There is even reset feature. Fine-tuning your diagnosis with these features will make pinpointing leaks a breeze. The flexible stainless-steel probe is 20cm (7.87”) long. The probe gives ample reach for measuring in difficult-to-access places. The flexibility makes it especially ideal for testing refrigerators and other household units. The LotFancy Leak Detector detects a wide range of chemicals. This includes refrigerants in the HFC, CFC, and HCFC categories, and specific chemicals ranging from R134a, R404a, R22, R502, R125, R124, R123, R500, R503, R12, R11, and beyond. Sensitivity is also important when detecting leaks. The Leak Detector has a maximum range of sensitivity near 6g/yr - that’s powerful for a handheld leak detector. The power supply for LotFancy Leak Detector may be confusing or temperamental for some users. We’ve heard this has even led to a few units returned as defective. In spite of this, it is worth noting that the LotFancy Leak Detector takes 4 AAA batteries (not included). LotFancy includes instructions for battery insertion. The unit should last for 50 hours of use with proper installment. This device’s sensitivity and many settings sometimes give confusing or false results. This should be fixable with the unit’s various modes. But it is still worth noting that there may be a learning curve with this tool. Also, if you’re sensitive to sound or trying to work discretely in a client’s home or place of business, the volume of the alarm to be irritating. The LotFancy Leak Detector is a great high-function, low-cost option for Freon-detecting devices. It offers many of the same features found in more expensive products, but at a lower price point. Like other products, it has a flexible nozzle, active detection, and adjustable sensitivity. Despite minor kinks, it has proven itself a versatile and reliable tool. As an HVAC tech, you'll face difficult-to-find leaks day after day. An easy-to-follow and precise tool is a must-have to keep from wasting hours of valuable time. 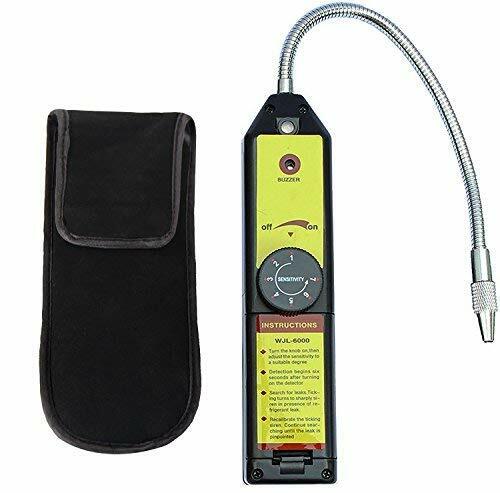 LotFancy Leak Detector offers valuable sensitivity in a lightweight, easy-to-use package. It is suitable for all types of jobs from home refrigeration to industrial AC settings. It comes complete with long battery life, flexibility, and 6g/yr sensitivity to identify tough refrigerant leaks.